I suppose that sums up motherhood for me right now. A little over seven weeks ago I birthed a daughter and nothing has been the same since. Well, I still live in the same house and still will always enjoy rich coffee, dark chocolate and yoga and I have the same partner, yet everything else seems somehow so different. 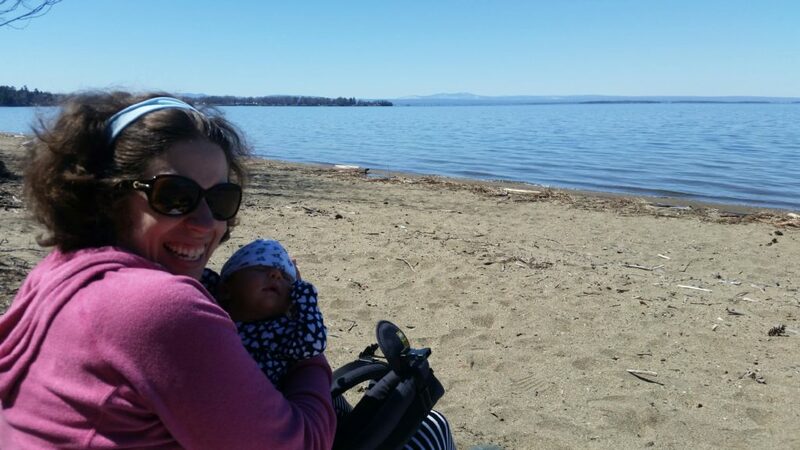 I sobbed when my husband, daughter, and I came home after a lovely stay at The University of Vermont Medical Center. Perhaps it was hormonal as my milk was coming in or perhaps it was exhaustion from birth and the cumulative effect of a difficult pregnancy with unrelenting nausea or maybe it was simply the fact that I had entered a new phase of my life and I realized how terribly overwhelmed I was. We had taken all the classes (breastfeeding and birth and newborn ones), I had read books about natural birth as well as What to Expect, I had gone to prenatal yoga and had bought all the necessary baby clothes. Yet, the change seemed so monumental. And still does. I now realize that while I had gone through the motions of doing the preparations, what I hadn’t done was say goodbye to my old life. I hadn’t said goodbye to the version of myself whose body was untouched by birth, who had the time to do anything, who never had to be responsible for anyone else and who could sleep for 10 hours uninterrupted. I didn’t realize I would have to give that part of myself up so quickly. Yes, I knew babies needed to eat every three hours and I was terrified of navigating postpartum depression. Yet, I had no idea how any of that would feel. How bone-tired I would feel and how I would start to dread the nursing sessions in wee hours of the morning and how demanding breastfeeding can be and how impossible it is to sometimes eat a meal and how hard getting out of the house can be. And how endless the laundry is. I also had no idea about the love. About the precious, tender, all consuming love. About how sometimes all the challenges don’t really matter because there is this glowing, beautiful love being I somehow birthed. There are moments when it still catches me off guard, such as when I casually pick out diapers in the diaper isle at the store or when I say “I’m Jimi’s mother calling” when I asked the pediatrician if her hiccups, plentiful spit-ups, and chin quivers were cause for major alarm (they’re not). There are also those moments when I feel a glimpse of my former self such as when my husband and I take a walk together alone or when I manage to get on my yoga mat or write in my journal. I may not be able to reconcile the two versions of myself yet, but it helps knowing she isn’t totally gone. I’ve also started to see my mom differently too. As well as every other new mom out there. While I am very new in the journey, I feel humbled by the stories from other moms and feel in awe of those who navigated these crazy newborn days and nights with other children to care for. When I see a mother with young children I now understand how exhausted she is. How she sacrifices so much of her time and energy every day. And I can also understand how helpless she might feel at times. “This feels like punishment,” I moaned to my husband last week around 5 a.m. after failing to sooth our screaming child. Sometimes it does feel that hard. And other times it feels so sweet, such as when I smell my daughter’s head and watch her tiny hands move through the air and when she opens her clear eyes after a long nap. She is starting to smile and I practically melt each time. Motherhood intensifies everything. It makes the good moments better and can make the challenges far, far harder. It has rocked me to my core in a way that nothing else has. It has asked more of me than anything and has also given me a great chance to grow. While the fourth trimester is as intensely demanding as I had read and heard it would be, it is also a time of great discovery and newness. Our world is so busy and we’re bombarded with social media and emails all the time and horrible political news that relaxing seems harder than ever. While I have struggled at times with being home so much, I can’t remember the last time I felt permission to stay in sweatpants all day and watch Netflix at 3 p.m. There is a grace in learning to surrender to the pace of the day (which can be frenzied and slow all in 10 minutes) with a newborn. There is a blessing in learning how to ask for help and how to say thank you to those that brought us delicious meals and big hugs and for those who text loving words. I am learning to see the gifts in slowing down, even if I sometimes resist it. I am learning not to panic every time my daughter cries. I am learning how to prioritize tasks better. I am learning how to still take care of myself and how to forgive myself. I am learning how to be a new mother and how to soften into my new role.